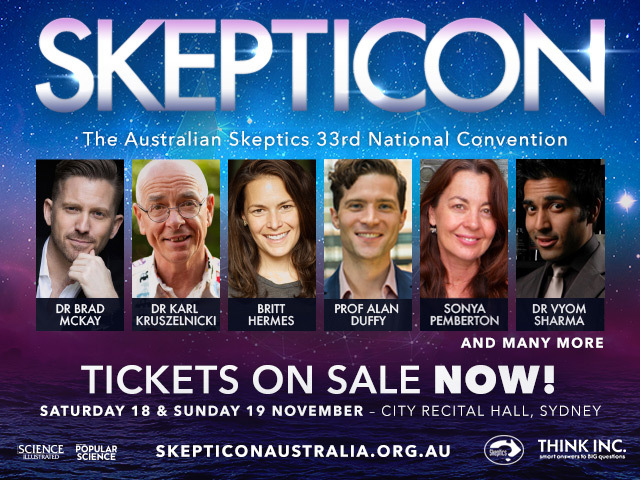 This November, Think Inc. will present Skepticon Australia 2017. The two-day ideas festival is the 33rd Australian Skeptics annual national convention, celebrating science, reason, and critical thinking. Originating from Melbourne, the Australian Skeptics investigate pseudo-scientific and paranormal claims, from aliens to quack cures. They release a quarterly magazine, give grants for skeptical and scientifically-oriented activities, and campaign for the education of pseudoscience. Also on the program are: former naturopath-turned-skeptic Britt Hermes from the Cognitive Dissonance and the Scathing Atheist podcasts, astronomer and science expert Dr. Alan Duffy, award-winning documentary filmmaker Sonya Pemberton, scientist and media superstar Dr. Karl Kruszelnicki and celebrity TV doctor Dr Brad McKay. Comedian and TV presenter Lawrence Leung, who will also be the MC. Speakers will cover a diverse range of topics, from Alan Duffy’s debunking of the hype of various technologies promising us a journey to Mars, to Captain Disillusion’s viral video myth-busting, and Britt Hermes’ exposé of naturopathy and its dangerous, unproven, and even illegal treatments. Dr. Brad McKay, Sonya Pemberton and Captain Disillusion will come together for a panel on how they use media as a tool for busting myths and boosting facts, while Ben Heard will be explaining the case for nuclear technology as the solution to our most pressing global challenges. Kate Browne examines how companies guilt new parents into buying products that range from the just plain silly to the downright dangerous. Don’t miss this festival of mind-blowing, myth-busting science!